In computer programming, Loop refers to executing a block of code repeatedly. So, why should we learn about Loops? Your manager has asked you to write down numbers from 1 to 100, each in a separate line. Okay, that is easy and manageable. What if he asked you to write from 1 to 1000?! Even worse, what if it was from -10000 to +10000?! Is it still manageable?! To achieve the worst case scenario, you have two choices: the first, is to spend about 8 hours of donkey work typing numbers (assuming no typing errors), or to write a loop in 5 minutes that achieves the requirement for you in few seconds. A loop with a loop variable, which in turn iterates over list (or range) of values. A loop that continues to iterate as long as a specified condition evaluates to true. A loop that iterates until a specified condition becomes true. So, let’s study each of these types of Loops one after another. The for loop uses a variable called the loop variable to iterate over a range of numbers. First, the loop variable gets initialized in the initialization part of the for loop. Next, the condition is tested, and if evaluated to true, loop body is executed. The update part, updates the value of the loop variable, before testing the condition for another iteration. This continues until the condition becomes false. At this point, the loop exits. The loop variable is tested if it is less than or equal to +100. If true, the loop body (the code block between curly braces) gets executed. The loop condition is tested again using the updated value of $i. If found to be true, the loop body is executed once again, and so on. Have you guessed how we will achieve this requirement?! No, I am not talking about the range. I mean how we will select only the multiples of 4. Yes, exactly! Using the update part. That was smart! Besides initializing the loop variable to -1000, and looping as long as its value is less than or equal to +1000, the update part increments the variable by 4 after each iteration. If you forget to update the loop variable, did it in the wrong way, or used an incorrect condition, the loop will not stop. i.e. it will continue to iterate forever. This type of loops is called infinite loops. So, pay attention when writing the for loop header. The loop will be endless. This type of loops is needed in some cases, given that the loop body contains a condition that if met, it will exit the loop. As its name suggests, the foreach loop repeatedly executes its body for each value in a list of values. The loop uses a variable that loops over the values, iteration after another. The list of possible values comes either from an array, or by using the range operator (..). We need to write a script that calculates the factorial of an integer. How could we do it? Have you noticed anything strange in the above syntax of the foreach loop? – Mmm, no, everything looks normal! OK, let’s make it easier and more specific: haven’t you noticed anything “around” the loop variable?! – Ye… Yes, there are square brackets surrounding the loop variable! Oh, do you mean the loop variable is optional?! 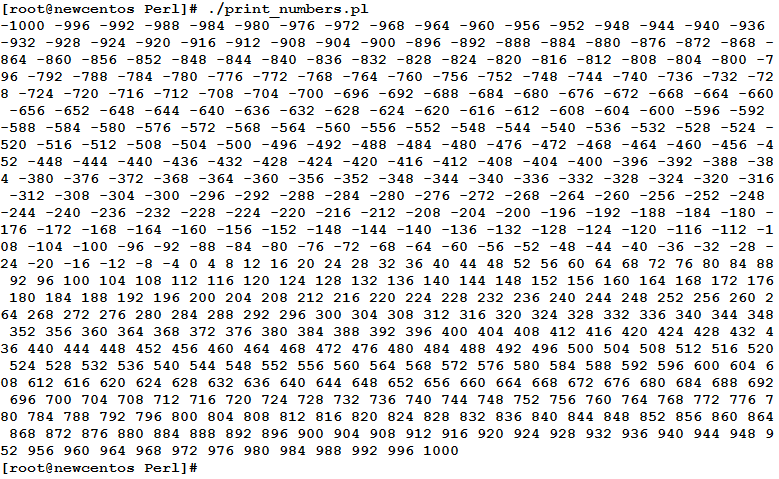 The Perl tools that use this variable include: the <stdin> operator, the chomp function, the split function, and… the foreach loop. In this article, we have started talking about Loops. Loops are needed whenever a block of code is to be executed repeatedly. There are several types of loops, each with its own features and usages. That was part one in the Loops topic. See you in part two.